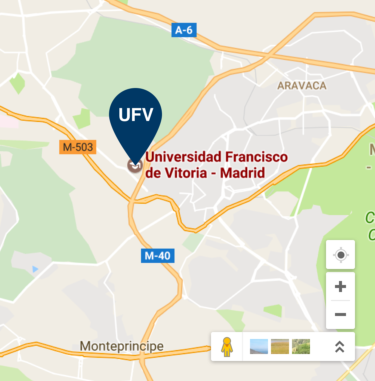 Universidad Francisco de Vitoria offers a supportive and caring campus environment which provides a wide range of extracurricular activities and services. In this way, students can get involved in an active campus life, building a strong community, meaningful friendships and having fun. We regard this as a fundamental part of a comprehensive education, ensuring a positive impact on the students’ personal development and wellbeing. The Voluntarios por la Acción Social (VAS) department coordinates approximately 200 national NGO volunteering programs in 74 centres and also international service-learning and humanitarian project in countries such as Ethiopia, Mexico, Brazil, India, and Equatorial Guinea. This department’s aim is to address those subjects that really matter to us all but that we don’t usually take time to consider, such as the desire that relations last forever, death, suffering, what God has to do with our daily lives, etc. Once a month we organise the ‘Café Newman’, where we discuss a different academic subject. There are also 2-hour mini-courses to look further into these questions, always based on a literary or artistic piece, guided by one of our lecturers. As culture is the expression of man and his drama, we like to move in it, to understand what our nature is a little better and what we really should wish for. If you are interested in doing an internship, this is the right place. Moreover, this department (Prácticas y Empleo) helps with your CV and organises workshops, seminars, lectures and other projects which help to improve your employability. This student society (Generación Empresarial) is an organization made by and for young people who are passionately engaged in fostering entrepreneurship among young people. If you have a creative business idea, dream or entrepreneurial concerns, this is your place. This society seeks, through training and networking in international organizations, to influence the spheres of decision-making in order to make social change happen, particularly with respect to women’s discrimination, poverty and human rights. Robert Schuman Institute for European Studies The aim of the Robert Schuman Institute for European Studies at UFV is to be the Gateway to training and understanding of the EU that every university should have. It also supports and encourages research activities in this area. 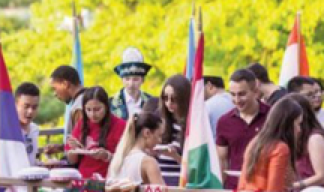 To this end, the Institute publishes various articles every year and organises academic and cultural activities in which you are warmly invited to participate. UFV’s European Documentation Centre (CDE) was founded in 1997 and is part of the Europe Direct Information Network formed by the European Commission in 1963. We are an active member of the Spanish European Information Network set up by the Representation of the European Commission in Spain.The aim of the CDE is to encourage and support studies and research on European integration, facilitate the access to information about the EU and its politics and participate in the debate about the EU along with other information networks. UFV wants its students to take the máximum advantage possible of their studies. This is why, through the Educational Orientation Office (Gabinete de Orientación Educativa - GOE), we show them how to better organise themselves, optimise both their study and spare time and overcome the difficulties they may find on their way. We also help them to develop their cognitive, emotional and social abilities integrally. This is a personal attention service, apart from seminars and workshops where one can participate by applying online. As a Catholic university, UFV is very much concerned with providing for all those who wish for Pastoral Care (Pastoral Universitaria). E.g. receiving sacraments, devotional exercise, prayer meetings, pilgrimages (Holy Land, St. James Walk to Santiago, Rome and Medjugorje) and humanitarian missions. There is a Catholic chapel where mass is celebrated daily. Open to everyone, this group comprises 40 students proceeding from all UFV degrees. The training (comedies, dramas, classic and contemporary pieces) is enriched by activities such as cultural trips, the participation in other universities’ contests and the organisation of the UFV Scenic Arts Week. Students can join the group for acting, but also for taking care of the staging, atrezzo, clothing, make-up, lights, sound and so on, so that each production may be carried out professionally. If you like singing, this is your place. No need to have a perfect voice, only a passion for music! The repertoire includes various styles, offering a wide range of possibilities to all voices. Meet new people, have a good time and get to know the most beautiful masterpieces. This is a must for creative people. Both lecturers and students get together and basically share their interest in creativity, innovation and artistic expression at all levels: literature, drama, painting and visual arts, design, advertising, music and audiovisual works. The UFV media group is basically managed and run by Communication students. Among others it includes a digital newspaper (Mirada21.es), a radio that broadcasts via internet (www.ondauniversitaria. es), TV channel broadcasting on campus and through the YouTube platform (Mirada21.TV); film production (students can shoot their first short films) and an advertising and design agency where you can launch your first campaigns (Up Mk & Com). We encourage the practice of physical and sports activity orientated to the physical, mental and social wellbeing of the university’s community. Moreover, we like to contribute to the improvement and upkeep of one’s health, life quality and personal development, transmitting educational values through the promotion, organisation, dissemination and development of physical-sports activities – be it for competition, training or leisure. The many facilities we have include a football pitch, five a side football pitch, basketball court, paddle and tennis courts, running track, volley and beachball courts. UFV teams: football, five-a-side football, basketball, rugby, volleyball and handball. In 2016 the building of our sports centre was completed, in which all of our students and staff can enjoy a discount. You can benefit from this centre with the latest-generation technical equipment and a great team of proffessionals for a very reasonable monthly fee that includes the possibility of doing machine exercises, but also spinning, crossfit, pilates, yoga, zumba, step, aerodance, hit tabata, combat, aeropump, streching, TRX, GAP, queenax… and swimming in a 25-metre pool. first aid point, free wifi zone, Banco Santander, driving school, printing service (reprografía) in all buildings, residence hall. The university’s library holds more than 30,000 volumes, including audiovisual materials, journals, research papers, silent study and reading rooms. UFV also has a shop on campus where you can buy sports equipment, stationery and merchandising, as well as books and teaching materials. Breakfast, snacks, coffee, soft drinks, sandwiches, “platos combinados”, etc. Simple student menu (1 course, bread, dessert): 3.50€ aprox. Complete student menu (2 courses, 1 soft drink, dessert, bread, coffee): 6.50€ aprox. The offer and prices are the same as the ones in the main cafeteria. It offers a wide variety of cold and hot sandwiches, snacks, coffee and salads. It also offers a wide variety of cold and hot sandwiches, snacks, coffee and salads.